”Thank you” to each of you who stop by and look at our website. Please ring or email if you cannot find what you are looking for - we may just have it in stock! 1890 Envelope addressed to 'D LLOYD GEORGE ESQR MPR MP, HOUSE OF COMMONS, WESTMINSTER" from Wales and then redirected from the House to North Wales, showing a SUPERB CIRCULAR "H. C. S. W./1D" HOUSE OF COMMONS S.W. CHARGE FOR REDIRECTION. RARE. 1809 Cover from Perth to "The Registrar of the Royal Hospital near Dublin", the charge of '2/-' has been erased and a very fine Dublin "MERMAID" FREE DATESTAMP applied. A rare example of Non-Parliamentary Free Mail. 1840 HOUSE OF COMMONS 'ONE PENNY' ENVELOPE addressed to Walmer, Kent. Very fine used. 1859 1d Rose-Red, SG 40, tied to envelope to Freshwater, Isle of Wight by a fine HOUSES OF PARLIAMENT "HP/1" in circle of bars cancellation, opening out to display a "HOUSES-OF-PARLIAMENT/SW" circular datestamp. Very Scarce. 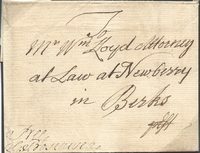 1765 24TH OCTOBER FREE ENTIRE from London to Wells, Somerset, showing a VERY FINE AND EARLY CIRCULAR-FRAMED 'FREE', L767, IN RED, USED DURING THE LARGE 'F' PERIOD - EXAMPLES OF THIS MARK USED PRIOR TO 26TH MAY 1766 ARE VERY SCARCE. 1821 Printed FREE frank entire headed "POOR RETURNS" SHOWING 'FREE/F. FREELING' AND ADDRESSED TO "THE HOUSE OF COMMONS" FROM AYLSHAM, NORFOLK. SUPERB AND VERY SCARCE. 1752 FREE cover endorsed "Free/G. Boscawen" of Charlton Forest, Oxford, MP for Penryn 1743-1761, from London to Newbury, Berks. 1906 'OC 3' Mourning envelope showing the rare OFFICIAL-PAID/♔ datstamp in Red and Edward VII Cypher in Violet. Rare and Attractive. 1848 HOUSE OF COMMONS cover addressed to CORFU "via TRIESTE", pre-paid '1/3', showing oval-framed 'PD' in Red and manuscript '5d/3/d8" accountancy marking of CORFU. Showing on the reverse a fine HOUSE OF COMMONS UNDATED CIRCLE IN RED. Ex Trapnell Collection. RARE. 1834 APRIL 12TH HOUSE OF COMMONS/TO THE OVERSEERS OF "ROTHWELL LEEDS" - WRAPPER SENT "FREE/F. FREELING" showing a fine FREE/♔ datestamp in Red. VERY SCARCE. 1847 St James' Palace to "Metropolitan Free Hospital, Lincolns Inn Fields" signed "George", Duke of Cambridge, Commanding Chief of the British Army at the Crimean War. 1902 Postcard addressed to "Prince's Gdns, S.W." 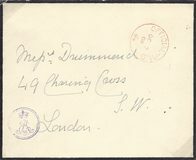 franked by a ½d Green, cancelled by a London Squared Circle; on the front is The Royal Arms of Great Britain and Ireland, cancelled by a "CORONATION DAY/ KING EDWARD VII. 26 June, 1912" cds. 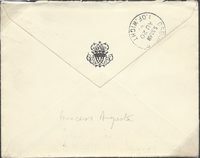 1908 "OFFICIAL PAID/KINGS LYNN" envelope addressed to Norwich showing a superb circular-framed KE VII crown/CYPHER in violet. 1887 5d Dull Purple & Blue, SG 207, Die 1, tied to "House of Commons Library" mourning envelope from London to Bombay. 1826 Entire to Bond Street, London sent from the House of Peers showing on the front a superb H.P. in red, L 560. Ex B Jay. 1833 Entire headed "House of Lords" to Camberwell showing a very fine Houses of Parliament H.P in Red, L 560. RARE.